While Blockchain (BC) started in finance (cryptocurrency) it is particularly valuable for Supply Chain (SC) applications. BC is a “distributed database” – every user (or just authorized if a private BC) on the BC has the data—not a collection of stove pipped databases. There is no “Central” controlling computer or company that owns and can alter the database on its own (again—unless a private BC set up this way). As a result of this decentralized, distributed nature of BC it is very hard to alter/hack/cheat the system. There is no single point of failure (many, most “nodes” can go down and BC still works). BC can also help enable parties who don’t trust each other (including competitors) to share and use the same BC to have both better sharing of information and less IT cost and complications. Blockchain technology enables one shared database with all the information, versus siloed databases that must be connected or accessed—and may not be trustworthy if controlled by another party or vulnerable to hackers and data theft or alteration. You can lock documents into the asset digital record on a blockchain so customs, other forms are easy to find and can’t be tampered with. With blockchain, all the parties involved, sometimes competitors don’t have to trust each other, can share the same system and share (or not if private information) data. Blockchains allow for greater traceability of goods—and confidence that the data is correct. It is feasible to have complete history of everywhere the item has been, who controlled, temperature, etc. It is thus great for avoiding counterfeit goods. BC can save money by disintermediating banks, lawyers, any company/authority that is now relied on as “trusted party” or controller of an information system. In Blockchain—it is computer networks and software systems that control and are trusted. “Smart contracts” that are locked into the blockchain system and executed by the computer network when agreed upon conditions are met—not lawyers. Using an unhackable digital currency to pay for online transactions (cryptocurrency—like Bitcoin, Ether, others) let you avoid banks or their big fees. An extremely valuable feature of blockchain (developed by the “Ethereum” blockchain) is the ability to use “smart contracts.” There are programs that run in the blockchain to execute assignments like sending out information, making payments, transferring ownership when the programmed conditions of the smart contract are met. Smart Contracts can notify parties of goods arrival, automate invoicing and payments. They play a key role in disintermediating banks, lawyers, and middlemen and administrative personnel in shipping and logistics process, saving money and lowering costs. For businesses, Smart Contracts may be more valuable than the cryptocurrency aspect of a BC. They are especially valuable for SC applications. All Industries will end up using BC, many for SC applications. The ability to have a virtually hack proof shared database and use Smart Contracts is relevant to almost all businesses. The tremendous amount of data from the “Internet of Things” is readily accessed, used and reliably recorded in a BC. For example, you can use a date/time stamp from a port to know the exact time of arrival, and access temperature data to be sure a shipment of fresh goods never went out of temperature limits. Every industry involves some kind of sourcing; so at a minimum, supply chain BC applications are likely to impact most companies that sell products. If there is a shipping delay a problem with a payment, anything out of what is planned, “Smart contracts” (programmed instructions) can immediately notify all relevant parties of the change and execute agreed contract terms. IBM and Maersk Shipping’s Global Trade Digitalization project (GTD) is already a proven SC system. This blockchain system keeps track of all documents for an ocean shipping container, notifies all parties of its movement, and changes in status. Government approvals and all information needed for a transaction and shipment are securely locked into the blockchain so all who are authorized can see it, but only legitimate, authorized entries can be made. Avoiding Counterfeit goods is a key benefit for Supply Chain applications of blockchain. A report commissioned by the International Trademark Association and International Chamber of Commerce estimated global economic value of counterfeiting and piracy in 2015 at $1.7 trillion. Counterfeiting is forecast to reach $2.3 trillion by 2022. Counterfeiting is so widespread, even the smallest suppliers are victims. A five-employee company in San Marino California selling just 100 of a $135 cycling shirt found a counterfeit version of their design and logo on Alibaba, the huge Chinese e-commerce site. The reliable, easy to see the “traceability” of a product moving through the supply chain system on BC helps avoid counterfeits. You can see (and trust the data is accurate, not hacked) that the contracted manufacturer did submit the product at the correct place, with the correct contract attached to the digital asset in the blockchain. You can see product moving through the system as well. When a crate or shipping container passes through a port, an “Internet of Things” date and time stamp can be transmitted and received and then recorded in the blockchain: Container XA47 arrived in Port of Los Angeles at 4:15AM on Dec 22. If a counterfeit product is substituted—it won’t be in the blockchain. The blockchain is similarly useful for avoiding stolen goods: If trucking company shows up at dock to pick up product rather than using papers they provide, if BC contains the information on the trucking company contracted to pick up good (attached to the BC record of the product) check that to ascertain if this is proper truck or a thief. Airbus is implementing blockchain to control the many complex parts that come together to make a jet plane and other BC applications. Sensitive design data will be sent via BC to guarantee quality and security standards and exploit smart contracts. Airbus sees BC as way to overcome compliance issues, high overhead cost for data reconciliation with multiple parties they must share data with. They are also applying BC technology to pilot certification so they can be confident they have “immutable data” they can trust. Airbus is using a Linux Foundation-backed Hyperledger blockchain. SharedChain.io is a startup company planning to revolutionize logistics and supply chain operations with a shared supply chain system and shared blockchain. 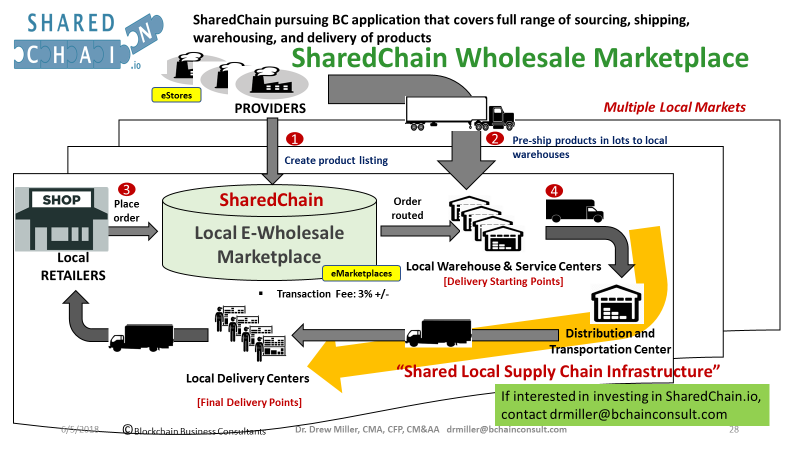 SharedChain is a “Massive, Shared, Open, Virtually Integrated, Optimized, Low Cost, Supply Chain” that also leverages blockchain technology to provide an accessible, secure database with automated billing and counterfeit goods protection that enables small suppliers and retailers to assemble an integrated supply chain to compete against and defeat Walmart. With local warehousing, SharedChain is particularly ideal for same day delivery, creating a local e-Commerce Marketplace without the high costs and risks of long distance just in time delivery. 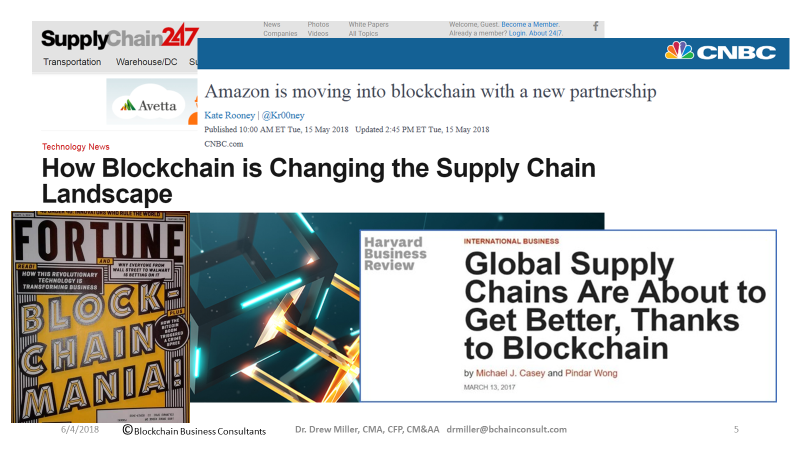 The “Chain” in the name for this company refers to both Supply Chain and Block Chain. Blockchain technology enables one shared database with all the information, versus siloed databases that must be connected or accessed—and may not be trustworthy if controlled by another party or vulnerable to hackers and data theft or alteration. You can enter a case of product as an asset in a blockchain database and now track its progress through the supply chain and add information to this digital record of the physical product. The reliable, easy to see the “traceability” of a product moving through the SharedChain supply chain system helps avoid counterfeits. You can see (and trust data is accurate, not hacked) that the contracted manufacturer did submit the product at the correct place, with the correct contract attached to the digital asset in the blockchain. You can track product moving through the system, with “Internet of Things” time stamps and destination information automatically added. If a counterfeit product is substituted it will not be in the SharedChain private blockchain. There won’t be one “killer app” for blockchain, but it is clear that blockchain applications in the supply chain are a particularly useful, powerful area to reap the benefits of this new technology.